Even if Ursula Haverbeck is incorrect, misguided and deluded, she should be free to express her thoughts. We beat Hitler to have freedom of thought and expression, so I thought. We won WWII to be free to tolerate unpalatable ideas. So long as ideas are not imposed upon another, a thought is just a thought, not an act of harm. Unfortunately, a thought is considered a crime in some countries and the template of Orwell’s 1984 is being played out in Germany. 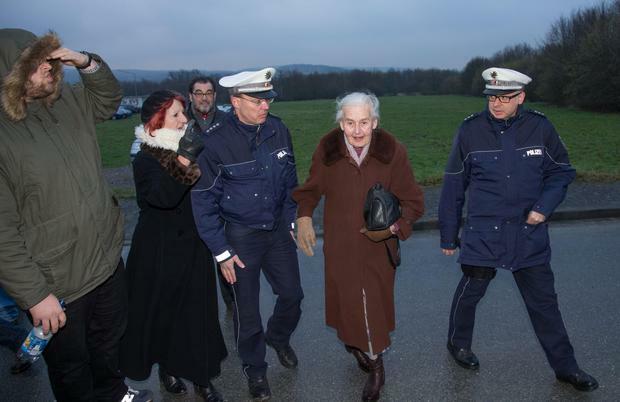 Ursula Haverbeck (2nd R), repeatedly condemned Holocaust denier, is taken away by the police after she tried to attend a trial that started against a former Auschwitz guard on February 11, 2016 in Detmold, western Germany. BERLIN — German authorities say they’ve apprehended a notorious elderly neo-Nazi and taken her to prison to begin serving her sentence for Holocaust denial. Police and prosecutors told the dpa news agency Monday that Ursula Haverbeck, 89, was picked up at her home in the town of Vlotho in central Germany. Haverbeck, dubbed “Nazi-Oma” (Nazi grandma) by German media, was convicted of incitement last year in Verden state court and sentenced to two years in prison for denying the Holocaust, a crime in Germany. She was supposed to report to prison last week but vanished, prompting a search for her. It was not immediately clear when she returned home. An estimated 1.1 million people were murdered at the Auschwitz camp between 1940 and 1945 before the Soviet army intervened, freeing the remaining 7,000 prisoners. A while back I was intrigued that people could be imprisoned just for expressing a view. So I did my research and discovered plenty of excellent information. It seems that Zyklon B was used for delousing as it was not suitable for gassing people to death. It also appears that because the Allies bombed the supply routes the prisoners as well as the. guards died of starvation and typhus. Even if others don’t agree with me, we are supposed to be able to express our views in a free world that appears daily to be becoming not so free.